At flipkart.com you can purchase Philips Avent 3-in-1 Electric Steam Sterilizer - 6 Slots for only Rs. 3,164, which is 25% less than the cost in Ebay (Rs. 4,199). The lowest price of Avent 3-in-1 Electric Steam Sterilizer - 6 Slots was obtained on April 20, 2019 2:39 pm. The sterilizer’s unique modular design enables you to fit the bottles and accessories flexibly, and organize them easily. Thus loading and unloading are very convenient. It also takes up minimal kitchen space. 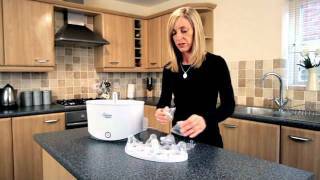 The sterilizer will keep its contents – baby bottles, breast pumps etc – sterile for up to 24 hours if the lid is unopened.